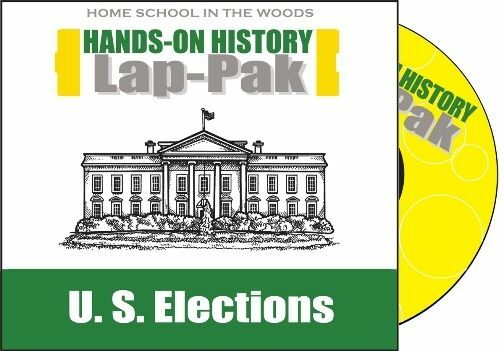 What better time than an election year to study HISTORY Through the Ages Hands-on History Lap-Pak: US Elections from Home School in the Woods? I am a HUGE Home School in the Woods fan, and a huge politics nut. I have always hoped B would take after me and love politics just as much. I have always made it a point to take him with me while exercising my right to vote so that he can learn the process in a hands-on way. So of course this lap-pak is a natural fit for us. 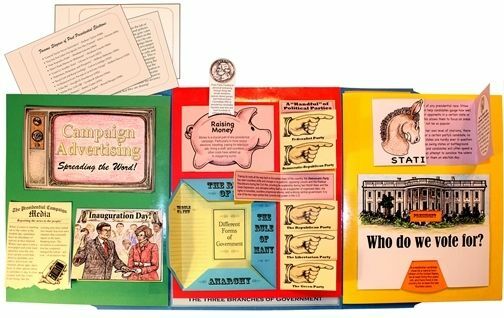 Like all the other great products from Home School in the Woods, the US Elections lap-pak is a host of hands on projects that give students a firm understanding of the topic at hand in a fun and creative way. 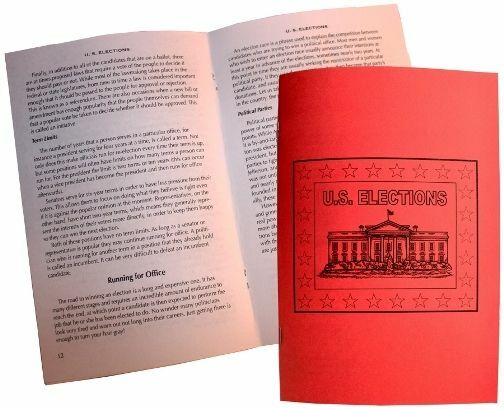 This set focuses on elections at the Federal level, but a lot of the principles can be applied at the state level, as well. 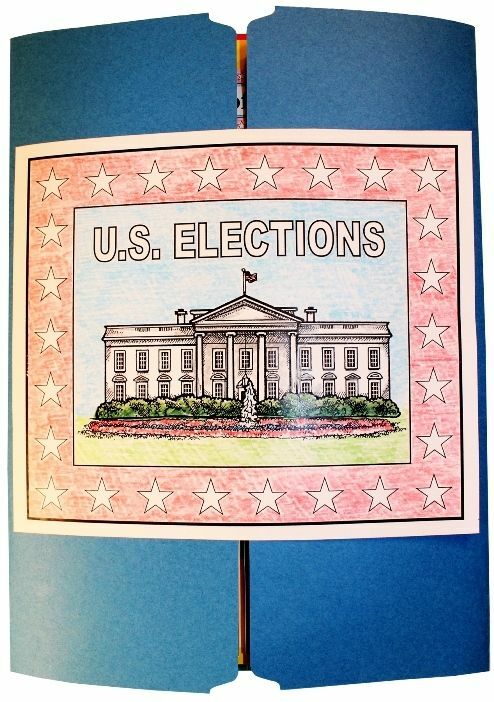 Marketed to students third through eighth grades, the US Elections lap-pak is a great resource that includes 21 lap-booking projects and a 24 page booklet that also doubles as the educational reading text for each project. For this review, we received the digital download version. There is also a physical disc available, and both options contain the same materials. I couldn't wait to get started with this lap-pak! As soon as I heard about it I was way too excited! Two of my favorite things-Home School in the Woods and Elections....combined?! YES! The first thing I did was go over the Project directions to get a sense of how much prep was going to be needed. As with all Home School in the Woods products, there is a bit of prep time and supplies that are needed. I did find this particular lap booking set has less prep needed than some of their others. For the most part, all I had to do was read over the directions and make sure I had the right PDFs printed on the right paper. I very much appreciate the easy to follow directions that break everything down into easy to follow sections. I decided I wanted to work slowly through this, and stretch it out a bit. As a result, I scheduled us to do 2-3 projects a week, taking our time to fully explore each topic. Home School in the Woods is great to suggest further reading! I print everything I want us to do for the week at one time, and I gather all the supplies needed. Some projects are pretty fast and we completed those in minutes. Others I chose to spend more time on, such as the branches of government, so we worked on that one for a couple of hours spread across 2 days while reading about the topic on a 3rd day. Each set of directions will tell you what needs to be printed and one what type of paper. There are suggestions for colored paper, as well. The instructions also tell you what supplies are needed for each step. We like coloring, so tend to print EVERYTHING on white, then color what we want. A few supplies you'll want to keep on hand for any Home School in the Woods product are regular printer paper, card stock paper, double sided tape, glue/glue sticks, scissors, exacto knife if you prefer for some intricate cuts, paper brads, folders, and colored pencils. It sounds like a lot, but I usually have most of this on hand all the time anyway. He's filling in a sheet that contains "fill in the blank" sentences. This is an example of the instructions suggesting to print on colored paper. Mr. B wanted fall leaves, so we colored them in ourselves! How clever! I loved this project! You can see in the background how the directions are presented. We took liberties with the coloring, giving this grass, sky, and even clouds! Each branch of the tree details the branches of government. This has nothing to do with the branches of government I chose to showcase for this review. I just really liked this project haha! You have to use an exacto knife to cut around the thumbs and insert the amendment pages. I had way too much fun with this one haha!! We aren't finished with our entire lap book yet since I'm choosing to work slowly with each topic. But as you can see from the graphics below, Home School in the Woods has once again given us the opportunity to learn while created nothing short of a work of art. See the blue project there on the bottom that says The Rule of Many, Anarchy, etc? Mr. B learned so much from this lesson that he has used what he learned in his pretend play! He created his own country and said it was a "Rule of Many" nation haha! And the "Who do we vote for?" project is hanging on the fridge. He isn't quite finished "playing" with it for me to add it to the lapbook. The American Experiment project is neat! The test tubes go on the cardstock sheet with paper brads so you can twist them around. This is the reading text! Overall, Home School in the Woods knocks it out of the park, once again! We LOVE this! I can't recommend Home School in the Woods or the US Elections Lap-Pak enough! 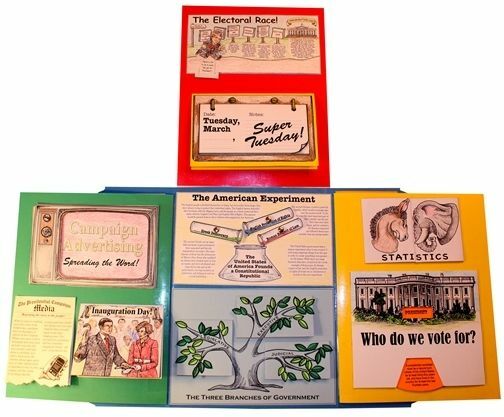 Does Home School in the Woods HISTORY Through the Ages Hands-on History Lap-Pak: US Elections pass my 4 Ingredient Test? I found it much better to work the lessons in order due to the nature of the text pages. The text pages can be printed as one document, or printed as a booklet. I found it easier to work in order so the information in the text would make more sense. You can definitely set your own schedule and take breaks as needed. There are no hidden fees with the program itself. It does NOT include the supplies, so you will need to make sure you have the needed supplies. But again, it's basic arts and crafts supplies that most of us will have already. Ink can be an issue with a lot of printing, but I purchased an inexpensive laser jet printer that I can get toner for, for around $14.00, and it prints 2500 sheets so that's not been a problem for us at all. You can use this with multiple age/grade ranges, easily. It's long lasting if you extend the lessons the way I do, or it can be relatively short lived if you work faster. It is probably a perfect program for kids with ADHD and autism. You may have to help special learners, especially those who lack fine motor skills, but it is a fun and entertaining, yet calming activity. I really enjoyed doing the projects with Mr. B. I did some of the more detailed cutting, so that is something to think about. Right now is the PERFECT time for this with it being an election year. This will tie in perfectly with election history-such as suffrage, political parties, types of government, etc. It will also tie into civics lessons. Please check out the Schoolhouse Review Crew to read others' reviews on this product!